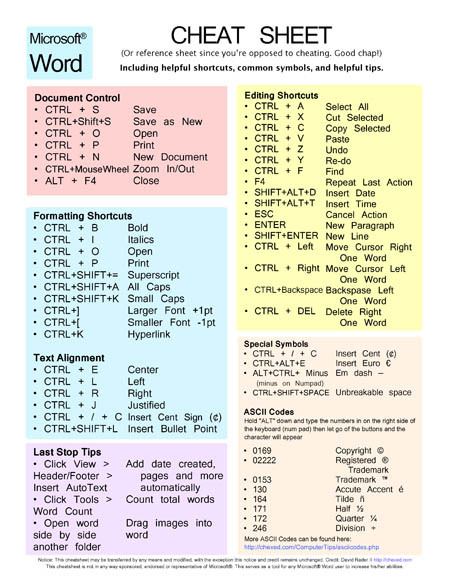 Enter the timeless free Microsoft� Word cheatsheet! I made it, so I can verify this one is legal to copy, sell, distribute, and even change if you want to. Considering nearly all of this works with older and newer versions of Word, it's been labeled "Timeless." If you have any suggestions, please leave a comment and if possible, I'll update it. Thanks for sharing this. This will be really grateful for word users. I think this is fabulous !!!!!!!!! Hosted by HostNine This page was created in 0.00295090675354 seconds.